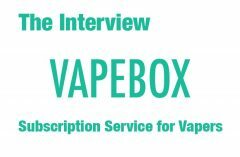 Don’t miss the in-depth Spinfuel eLiquid Team Review for Vape Organics! Sheerlie & Eko: Eko is the Founder and Sheerlie is the Director of Operations. Sheerlie & Eko: Our parent company, TCI Laboratories, was approached a couple of years ago by an e-liquid company looking for contract manufacturing. But then we saw the proposed ingredients and the emphasis on low cost rather than quality. We realized that with 20 years of experience in manufacturing behind us and a passion for quality, we have something to offer this industry to help it move forward in a big way. Sheerlie & Eko: Riverside, CA. Basically we’re in the vaping capitol, but at the same time there is a lot of push-back from the authorities on both the county and state levels, trying to lump vaping and smoking into the same category. In terms of peoples’ attitude, it’s pretty open and e-cigarettes are becoming increasingly popular. We basically see vapers everywhere. As vaping is becoming more mainstream, awareness is likewise increasing, leading to an increased demand for high-quality, pure and organic e-liquids. Sheerlie & Eko: Our original line of 6 flavors was dreampt up in the space between limit and imagination. Our pool of flavor options, considering our commitment to only real extracts over artificial flavorings, was limited. We knew we could create interesting, full-bodied and authentic flavors, but it demanded creativity. Each flavor required seemingly endless rounds of experimentation, of back-and-forth with our flavor company, which was also pushed to new heights in the creative process. Our aim was to create a line with a variety of flavor categories, showcasing the rich flavors of the natural world and simultaneously shattering misconceptions about what “organic” tastes like. Sheerlie & Eko: True to the description! Our e-liquids are straightforward because they are pure. While some of our flavors can be lighter than other products on the market, the flavor is clean, not boring. It’s amazing the fullness of flavor that can be achieved with only natural extracts, and no artificial sweeteners. Sheerlie & Eko: We conduct micro testing, a 48-hour process, on every batch of product; at the same time, we start a 5-day yeast and mold testing process, so our product is steeped for at least 5 days before being bottled and shipped. Thus, our e-liquids are pre-steeped and do not require home steeping. Sheerlie & Eko: With great attention to detail! Our e-liquids are packaged in amber glass bottles to protect against potential sun damage and oxygen contamination. We use child resistant caps to keep the little ones safe, and tamper-proof seals. To uphold our commitment to the environment, our labels are printed on recycled paper. Sheerlie & Eko: We mix and fill in one of our ISO class 8 clean rooms and the finished product is stored in a separate temperature-controlled room near our designated shipping area. Sheerlie & Eko: Our facility is both certified organic and we also hold an FDA manufacturing license, so we follow the most stringent standard operating procedures and good manufacturing practices, as outlined by the FDA and USDA. All equipment is cleaned and sanitized prior to and following use, recorded in our mandatory cleaning and sanitation logbook. Sheerlie & Eko: Our driving mission is to offer e-juice that is of the highest quality, which determines the ingredients we use: real extracts, vegetable glycerin, and organic nicotine (optional), which we extract in-house from USDA organic tobacco grown in the USA. We do micro testing on the raw materials, and again on the final product, along with yeast and mold testing in our lab. We have also commissioned an external lab to test our e-liquids for traces of diacetyl and acetyl propionyl, and are very happy with the results. Sheerlie & Eko: We have a batch card for every flavor, so every ingredient is measured using a calibrated scale ahead of time, and then we test to cross-check the nicotine level in the final product. Sheerlie & Eko: Our e-liquids are truly compatible with all hardware, but flavor is best when dripping, although some of the new tanks are extremely comparable in flavor production. Not too much heat or wattage are required when vaping our e-liquids, so sub-ohm coils are also great. SPINFUEL: What is your suggested, or “house blend” for PG/VG ratio for your eJuice? 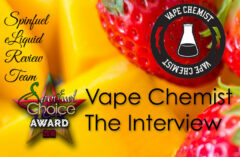 Sheerlie & Eko: Our e-liquids are all 100% VG! They’re not too thick, though as we have a custom formulation rendering them similar to a 70/30 blend. Sheerlie & Eko: We create a master sample, to which every batch is compared in terms of physical appearance, color, viscosity, pH… and then we test the flavor, too. Sheerlie & Eko: Our nicotine is the purest nicotine available, being USDA-certified organic and processed via CO2 extraction, so in this case it does not. Sheerlie & Eko: I was a smoker, not a heavy smoker but a smoker nonetheless (Sheerlie). I am a health nut… I practice yoga daily, I eat only organic food and cook almost everything I eat from scratch, and smoking cigarettes was my one vice, even if they were American Spirits. I felt horrible about myself for it, and vaping helped me transition out so that I could live more truthfully. Eko was never smoker, but he tried vaping out of curiosity and the rest is history. Sheerlie: We’re both obsessed with Blackberry + Mint. It defies all categorical preferences. It’s just so refreshing, unique, and the perfect all day vape. I also love Caffe Latte and Peanut Brittle—both are so rich and true. Eko: I am a big fan of Mango Mystique… I was raised on the islands of Indonesia and the taste is so true… it makes me nostalgic. Sheerlie & Eko: All are important, and so is balance. Everyone has his/her own order of priorities, but I think as represented by our e-liquids, flavor and vapor are most important. 100% VG means a smooth rather than harsh throat hit, but throat hit is also affected by nicotine level so consumers can play with the variables in that way. Sheerlie & Eko: Of course we are expecting heavy regulation, but from the beginning we have done everything in our power to take preemptive action, ensuring our continued presence in this industry. We aim to be a source of stability during uncertain times. Sheerlie & Eko: As we say, vaping is a lifestyle choice; choose wisely. Most vapers made the switch from smoking to vaping because of health considerations, so why not go all the way? Have your cake and eat it, too, with a truly organic e-liquid.